A discussion panel - including Belgium coach Roberto Martinez – have said the "environment is ready" for "a whole cohort" of gay football players to come out during their playing careers. 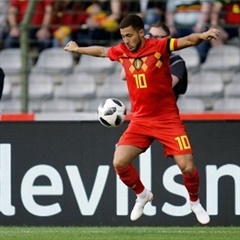 Belgium hold on to top spot in the latest FIFA world football rankings while England are on the rise, snatching fourth place from Croatia. Belgium could be without Romelu Lukaku despite being picked in Roberto Martinez's 28-man squad for their upcoming Euro 2020 qualifiers. Belgium will end the year as No 1 ahead of world champions France in the global rankings released by FIFA. Police raids across Europe sent shockwaves through Belgium's top football league as prosecutors targeted the country's biggest clubs. Belgium have joined Soccer World Cup champions France as joint leaders of the FIFA world rankings. Romelu Lukaku scored two goals as World Cup semi-finalists Belgium began their Nations League campaign with a comfortable win away to Iceland. World Cup semi-finalists Belgium capitalised on a series of Scotland mistakes as they thrashed Scotland in an international friendly. Belgium promoted Thierry Henry to the number two job with the national side, just days after he turned down the manager's job at Bordeaux. Eden Hazard is sensationally set to hold talks with Real Madrid to become the latest Galactico as attacker edges closer to a Chelsea exit. Toby Alderweireld feels he did enough with Belgium at the Soccer World Cup to re-establish himself in the Tottenham Hotspur side. Manager Gareth Southgate said England have "no illusions" as to their standing in international football after the World Cup in Russia.